After last weeks tough (muggy) conditions and subsequent awful run, I headed over to Central Park (carrying some stanchions) looking to return to being a sub-20 runner. The stanchions and directional signs I was carrying were part of the original kit that had been residing in my garage. 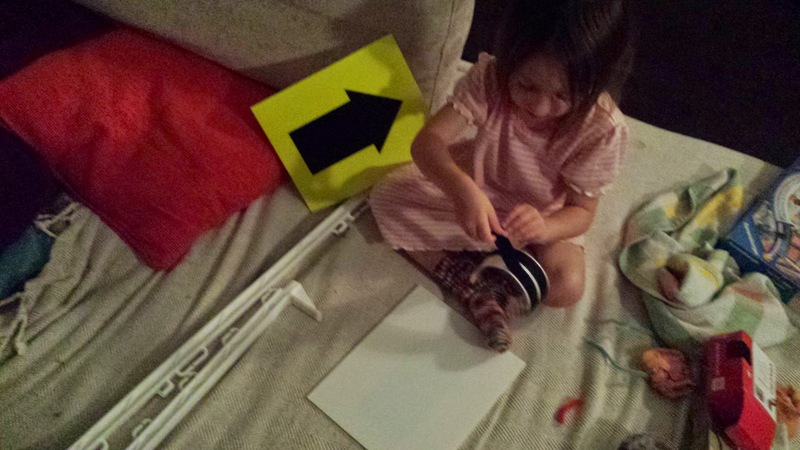 The night before I and my little helper had sat down at home with the roll of adhesive velcro tape and finally finished off the job that we had started back in July. We now have a few extra signs for setting out the course if we have to change it during the winter when the weather could cause problems. As usual, me and Richey (ed) got to work setting out the course and before we knew it we were back at the Dartford Harriers clubhouse and the runners were arriving. I couldn't help but notice that there were less runners than usual - the start of the half-term and the xc races later that afternoon both most likely played a part. When analysing our course I have noted that on paper the first kilometre should be the hardest of the run as it contains the entire elevation gain from the main park, across the bridge and also the uphill trail part. However, with fresh legs and the flow of the crowd, it quite often ends up being one of my fastest km splits. The second km is usual my fastest split and this is expected as it is the km with the most amount of elevation loss and no elevation gain - it is also about 90% tarmac. The third kilometre is almost entirely flat, but does have the slight incline across the bridge included. The fourth is the second hardest split on paper, but when you add the tiring legs, this in effect becomes the run's hardest kilometre split. It features the whole of the grass/trail section including the second helping of the uphill incline, and even though it also contains the twisty downhill path from Ivy Leaf Corner back to the main part of the park, it is still a toughy. The fifth and final kilometre is almost all on tarmac and flat, but it does feature the twisty section around the gardens at the front of the park. The very last part of the last km is back on the grass which is a little bumpy underfoot, but shouldn't take too much time away as the runner is probably flat out by this point anyway. Conditions for the day's run were perfect; 9 degrees, no wind, and partly cloudy. Underfoot the grass and trail part was still holding up pretty well. The uphill trail section was covered in leaves and it made the tree roots hard to spot at times. I started well and instantly felt so much better than at the previous week's run-to-forget. 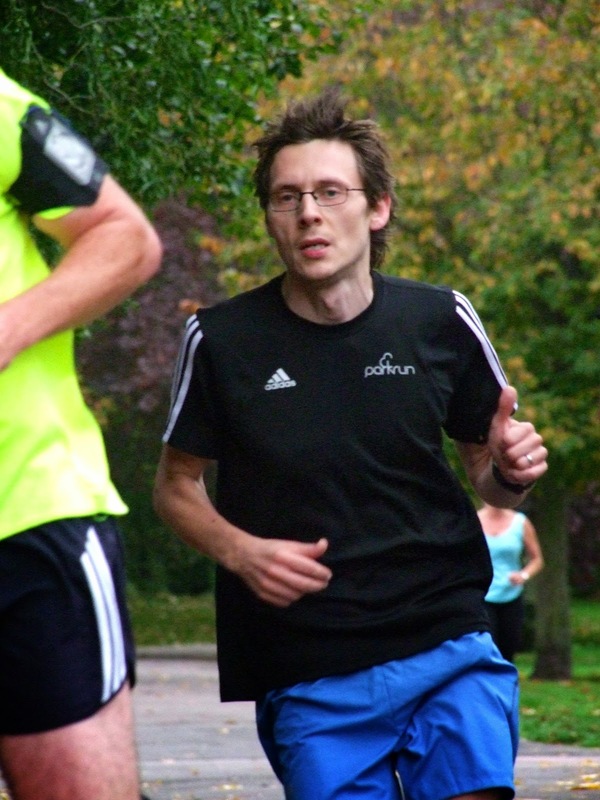 As I started lap two, I and two other runners had formed a pack and I really enjoyed running in this way. I did indeed manage to get back under 20 minutes so I am very pleased. 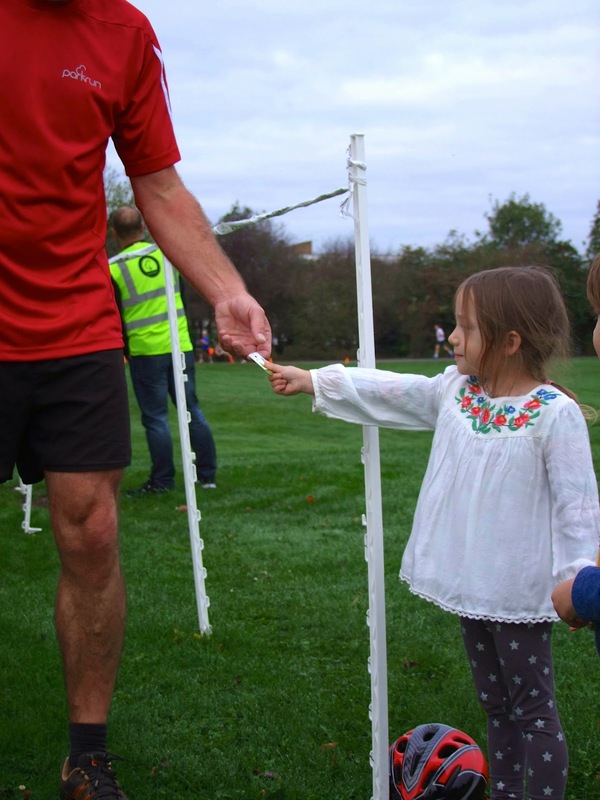 Upon crossing the finish line, I saw that my daughter was giving out finishing tokens and it was awesome to see her smiling face before she handed me my token. Once the scanning had been sorted (yes, I'm still running and scanning every week), I handed the scanner and tokens to Tessa for processing, and headed off to collect the signage from around the course. With that done I spent a bit of time in the clubhouse drinking tea, chatting and being chased around by a little tiger. To finish the morning off, I joined Richey for a freedom run before heading off to the market to pick up a few bargains. 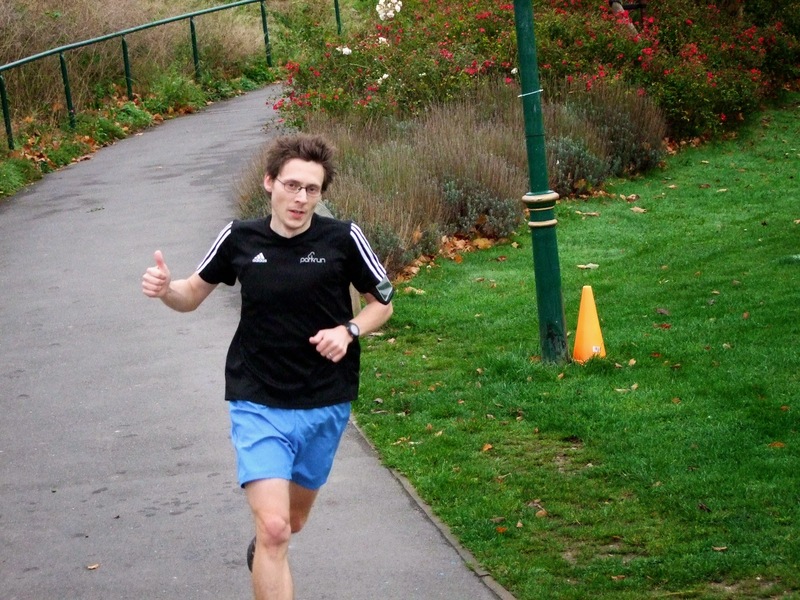 This was a very good parkrunday! 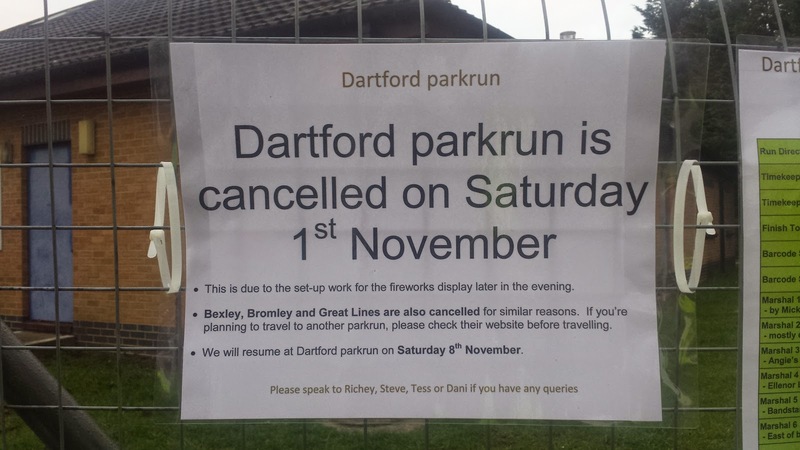 I've left you all with a photo of the notice that Dartford parkrun is cancelled on 1st November 2014 - please spread the word! 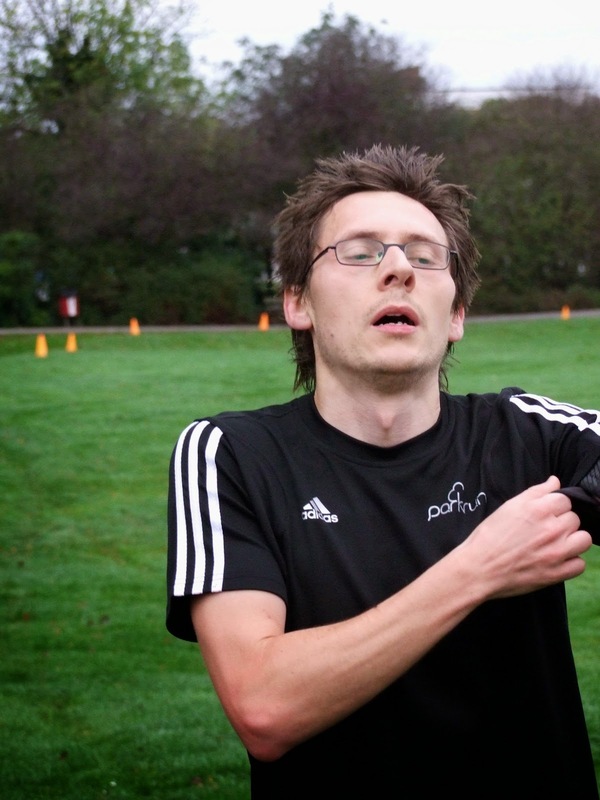 I'm hitting the road for a spot of parkrun tourism next week and I'm reaaaaally looking forward to it!